Archangel Sandalphon is the Archangel of music, poetry and prayer. Sandalphon receives and delivers prayers to the Divine so they are clearly heard and answered. Call upon Sandalphon if you’re having doubts that your prayers are being heard, and he will help to update you on the progress of your request, and tune into anything you need to do to transform your prayers into positive blessings unfolding in your life. Sandalphon also closely works with the flow of creativity through music, sound, and the spoken word. He can help turn sound vibrations into sound healing by raising their vibrations and he has a special kind of magic he uses to link creative work to the celestial realms. He is a wonderful ally for creatives, musicians, sound healers, and writers. Ask Sandalphon to help lift the vibration of your music of creative writing so that it is infused with Divine presence and angelic energy. 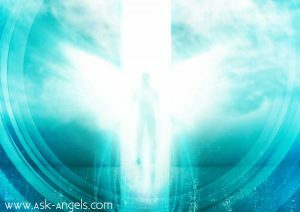 If you tune into the energetic signature, of Sandalphon, his presence is stable, consistent and tall… This is because Sandalphon acts as a bridge between Heaven and Earth, and like a tall turquoise pillar of light, he clearly illuminates everything between. Because he’s equally grounded to the Earth as he is to the Heavens, he has a very practical, down to earth energy and is accessible to people who are trapped in lower vibrations like fear, and negativity which can make many other Archangels harder to reach. With his grounded and loving presence, he will help you to be more self-loving, patient, kind and present so you can begin to lift your vibration, and link to the higher vibrational realms above. Sandalphon’s consistent Earth – Heaven link also makes him wonderfully supportive of animals, nature, and the elemental kingdoms as well… In many ways, he is a guardian of the Earth elements, and is deeply committed to helping Mother Earth and all who live upon her to ascend and re-link with the Heavenly realms of the Divine. The presence of Sandalphon to me feels tall, but grounded… Like a gentle, stable, and consistent energy which reminds you of your interconnectedness with everything. His guidance is soft but powerful, accurate, and almost poetic. He may even guide you through a song, a clever poem, or show up as angelic sounding music. Sandalphon has a wonderful way of helping people to realign with their truth… And then aligning synchronicity so you connect with the right people at the perfect time to validate your inspiration, answer questions, and help you to progress further into alignment with joining Sandalphon in being present, grounded to Earth, and fully connected to the Divine light above. I had one really nice lady tell me that a very tall angel stays with me. I do not have the correct spelling but his name is pronounced ESEFFEROUS a Serphim. Do you recognize this name? Or is she pulling my leg? Really need to know…. this is always on mind…. I believe in Angle’s. They are out there. . I recently connected to my angel Sandalphon I am very happy I have my own personal guide.